#DiverseKidLit for January. Share a link or find the latest diverse book recommendations here! It's been quite a while since I've published an #IMWAYR post, but it isn't for lack of reading! The NCTE conference back in November loaded me up with books and ARCs that I have already been diving into and cannot wait to talk about. But, in other big life news ... I'm due with my first child in an increasingly small number of weeks! I am certain that will disrupt my reading and posting (and really everything) life quite a bit, so I am setting myself a new goal of trying to get an #IMWAYR post up once a month, rather than every week. 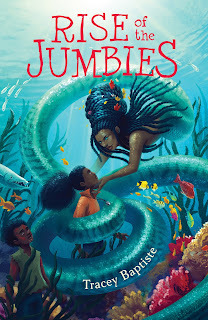 Rise of the Jumbies (2017) by Tracey Baptiste. This highly anticipated sequel to The Jumbies picks up shortly after the first book left off. Corinne feels confident that she has defeated Severine, but when children on the island start going missing, she suddenly has her doubts ... This is another well-told and engaging story, which also touches on some pretty heavy issues, including the Trans-Atlantic slave trade. Highly recommended. The 57 Bus: A True Story of Two Teenagers and the Crime That Changed Their Lives (2017) by Dashka Slater. This was my first read of 2018, and it is incredibly powerful. This is a nonfiction book about an incident that took place aboard the 57 bus and how the lives of these two teenagers were impacted. The author does an impressive job of building the reader's empathy for both of them and for helping the reader to see the ways that race, economics, gender identity (and expression), and decision-making intertwine in our lives. Definitely a must-read for high school teachers and students! What's next in your reading? I am so pumped about my pre-orders of Love and Thunderhead (Arc of a Scythe, book two) arriving tomorrow! I haven't even read The Jumbies, and here is a sequel. The 57 Buss looks like a fascinating read too. Thanks for the heads up. 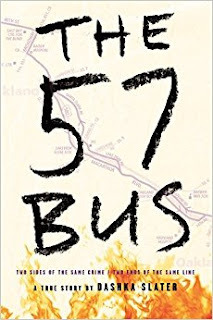 I've been reading so much buzz about The 57 Bus - it does look like a must-read and a very powerful one. We listened to The Jumbies this fall and loved it. Can't wait to read the next book in the series. I've been hearing so much about THE 57 BUS. I need to get around to reading that one soon!